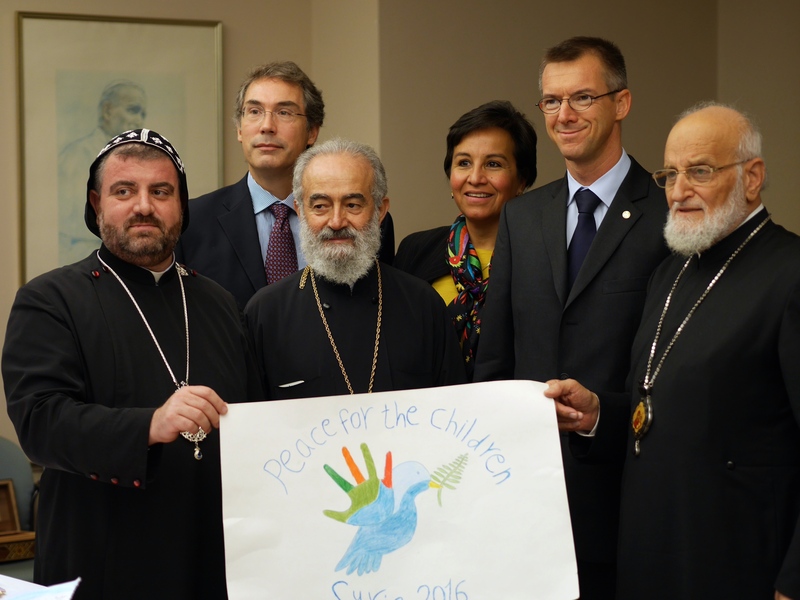 Acting as “Ambassadors of the Children,” three prominent Syrian Church leaders—Patriarch Gregorios III, the head of the Melkite Greek Catholic Church; Greek Orthodox Metropolitan George Abou Zakhem of Homs; and Syrian Orthodox Bishop Selvanos Boutros Al Nemeh of Homs—are this week visiting EU and UN officials, respectively in Brussels and Geneva. They are carrying close to a million Syrian school children’s signatures on a petition for peace in their country as well as countless drawings expressing the youngsters’ longing for peace, which were formally presented in the Belgian capital to the President of the European Commission, Jean Claude Juncker, and the President of the European Parliament, Martin Schulz. In Geneva, they will present the children’s messages to the High Commissioner for Refugees, Dr. Filippo Grandi, and the High Commissioner for Human Rights, Prince Al-Huzain. The prelates’ mission is the fruit of the February 2016 joint declaration of Pope Francis and Russian Orthodox Patriarch Kirill, which called on Catholic and Orthodox Christians to speak out in unison in calling for peace in Syria and for support of persecuted Christians.